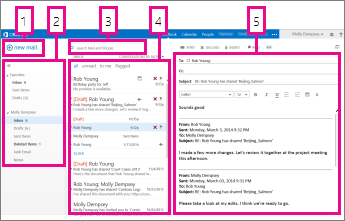 At the top of Outlook Web App, you’ll find notifications, links to each of the types of information stored in your mailbox, and links to your personal information and options. Icons will appear on the taskbar when you have a new message, or a calendar or task reminder. You can select the envelope to see a preview of the latest new message, or the calendar to view and manage calendar and task reminders. The icons appear only when there is a new message or an active reminder. 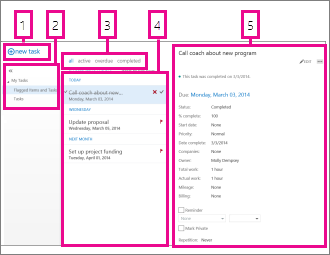 Select Mail, Calendar, People, or Tasks to switch to other modules in Outlook Web App. By default, you read and create items in Outlook Web App either in the reading pane, or in a window that overlays the main window. But that isn’t always what you need. Sometimes you need to be able to view or edit an item in a separate window. For most items, to open them in a separate window, look for the pop out icon in the upper corner of the item you’re working on. Select it to open that item in a separate window. To open a message that you’re reading in a separate window, select the extended menu icon and choose Open in a separate window. You can use Outlook Web App on your laptop or desktop computer when you’re not connected to the Internet. For information about setting up offline access, see Using Outlook Web App offline. When you sign in to Outlook Web App, you’ll go straight to your Inbox. For more information about messages in Outlook Web App, go to Mail in Outlook Web App. This is where you’ll find your messages. Create a new message by selecting New mail. Folders. The folder list includes the folders in your mailbox and Favorites. It might include other folders, such as archive folders. You can collapse this pane by selecting the folder icon at the top. You can expand and collapse folders in this view by selecting the triangle icons next to the folder names. Search window. Type what it is you want to search for here, such as the name of a person you want to find messages from, or text that you want to search for to find a particular message. List of messages in the current folder. Each entry in the list view has additional information, such as how many messages there are in a conversation and how many are unread, or if there is an attachment, flag, or category associated with any messages in the conversation. A conversation can have one or more messages. When a conversation is selected, you can delete it, add a flag, or add a category by selecting the icons. At the top of the list view are filters that you can select to quickly find messages that are unread, that include your name in the To or the Cc line, or that have been flagged. In addition to the filters, you’ll see the name of the folder you’re viewing and the view that you’ve selected. The reading pane, where the conversation that you’ve selected is displayed. You can respond to any message in the conversation by selecting the links on the right. 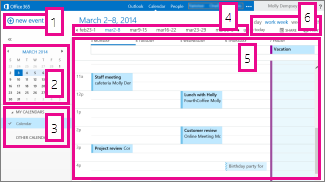 After your Inbox, the calendar is probably where you’ll spend the most time when using Outlook Web App. For more information about calendars in Outlook Web App, go to Calendar in Outlook Web App. Create a new event by selecting New event. An event can be an appointment, a meeting, or an all-day event. Use the calendars to navigate from one date to another. Shading will show you what week you’re currently viewing, and darker shading marks the current date. You can use the calendar icon at the top to collapse or expand this side of the calendar view. You can view more than one calendar at a time. This section lets you add other people’s calendars and select which to display. This is another area that you can use to navigate from one day to another. Select any of the dates to jump to that date. Or select the arrows on either end to see the dates before or after what’s displayed. The main window, where calendars will be displayed. Select the view you want, and share, or print your calendar. This is where your contacts are stored. From here, you can find, create, and edit your contacts. Also, you can search for contacts in your organization’s directory. 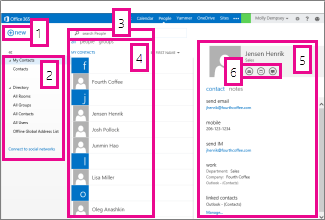 For more information about contacts in Outlook Web App, go to People overview - Outlook Web App. Create a new contact by selecting New. All the places you can find contact information. Search. Enter a person’s name here to search for them in your contacts and in your organization’s directory. List of all contacts in the current folder. The contact card for the selected person. Actions you can take directly from the contact card. Select the icons to send a message or create a meeting request. Tasks stores tasks that you create or that are sent to you, and also messages that you’ve flagged. When you view your tasks, the default view is Flagged Items and Tasks. You can change that by selecting Tasks in the folder list to the left. For more information about tasks in Outlook Web App, go to Tasks Overview. Create a new task by selecting New task. List of items that meet the current filter criteria. Select any item to view it in the reading pane. You can use the controls in the list view to make changes to an item’s status. For example, you can mark a task as complete, or remove a flag from a message. Note: Tasks might not be available to you depending on your organization’s settings.